LOVE LOCK Tell You Why Fashion Kills With Their 1st Single Release! | VKH Press – J-Rock & Visual Kei Coverage Worldwide! 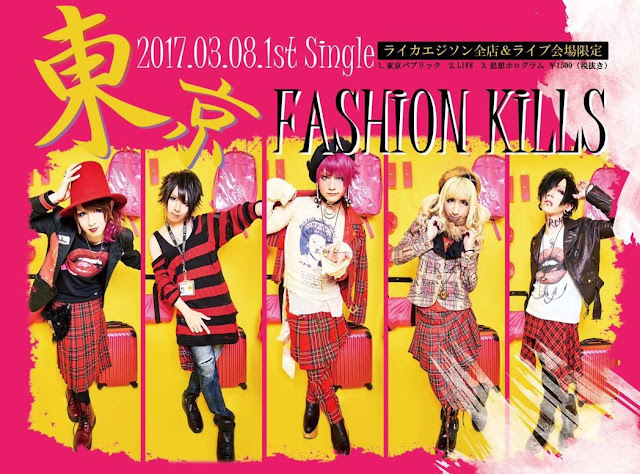 Home / ASTRO BOY / DragonWAPPPPPPER / Lolita23q / LOVE LOCK / News / LOVE LOCK Tell You Why Fashion Kills With Their 1st Single Release! LOVE LOCK Tell You Why Fashion Kills With Their 1st Single Release! Are you wondering why you're recognizing some of the members in the picture? That's probably because most of them have actually been around for some years already! LOVE LOCK is a very new band formed back in 2016. Their vocalist is Shibuya Hayato, former singer of 東京指定 (tokyo shitei) and ASTRO BOY! Lolita23q's drummer Ban and former DragonWAPPPPPPER and LAGNA bassist Gotaro are also part of this promising new band! Tomorrow, on March 8th, their first single 東京 FASHION KILLS (Tokyo FASHION KILLS) will already be available for 1620 yen! Unfortunately, you can only buy it at their live shows and at Like an Edison stores, so make sure you go there if you're in Japan right now!